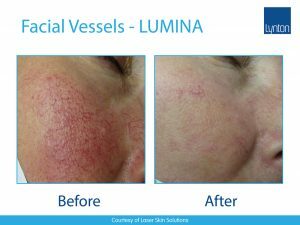 Long-term facial problems with flushing (Rosacea), thread veins and red spots. Thread veins and ‘red’ veins are a common problem easily treated with Laser Therapy. If you’re one of those people who always wants to cover their body and legs at summertime, we know how you feel. Many of our patients are fed up with unsightly red veins that are very visible, sometimes from distance. With just a few treatments, we can get your thread veins fixed for good. Simply call us below and book an appointment. Our friendly staff will help you get your laser journey started today. 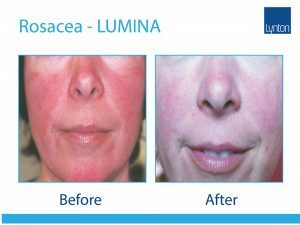 Light energy is applied to the skin where it is readily absorbed by blood vessels. The treatment heats the vessels and they are destroyed. 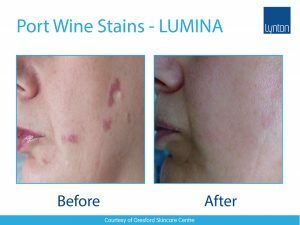 Most red skin lesions, facial thread veins, or deep “port wine” stains can be treated very well. Leg vessels can also respond well to laser. Fairer skin may have a slightly better result, but treatment is available for most people. The area may well feel warm after treatment, and cheeks can be delicate. There may be some redness up to 48 hours after treatment. Usually 2-10 Treatments of 15-45 mins will be sufficient for most skin types. For more difficult treatments, a longer course may be needed. Treatment is usually completely pain free, with moderate discomfort. Patients report the feeling of an elasic band “flicking”.